After a recent rear end collision on the Gene Snyder Freeway, the driver of a car involved was left severely burned after their car caught fire. Luckily, a fire rescue team arrived on the scene to pull them from their car after pedestrians had tried to do the same. The driver, who caused the accident, was conscious and alert after they were pulled from the car that had become engulfed in flames. While an accident caused the fire to start in this particular incident, there are many different reasons a car can catch fire. 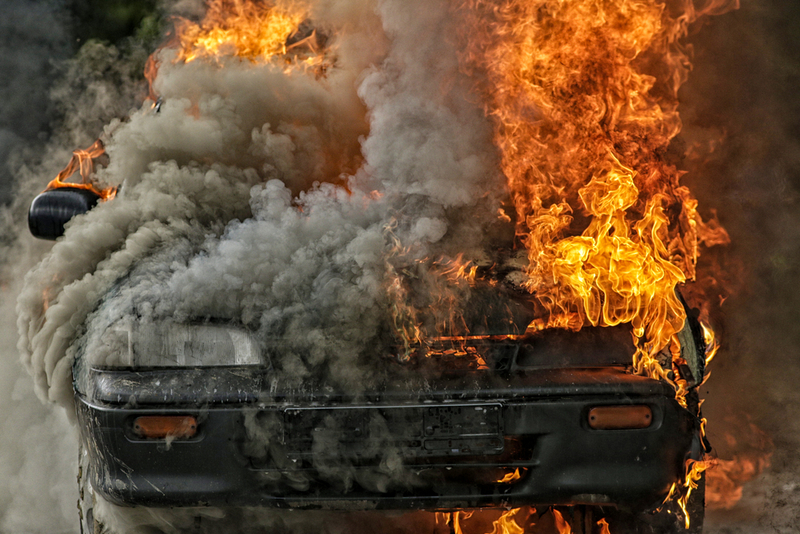 In fact, car fires happen to the tune of 33 times per hour in the United States alone and if you find yourself in this type of situation, you must take action immediately. While teens and young adults are more susceptible to car fires, they can happen to anyone if you don’t see the signs. Unlike the wreck on the Gene Snyder Freeway, some car fires can start without being in a wreck when smoke starts coming from under the hood. Many people will see the smoke coming from under the hood and think that they can make it to their destination before dealing with the problem. This is a grave mistake for your car. When smoke, no matter how much, is coming from under your hood you must stop immediately. After pulling over, slightly open your hood because opening your hood fully could help start the fire because you are rushing oxygen into the smoking area. If you have a fire extinguisher, stand at a safe distance and spray it under the hood to eliminate the possibility of a fire. This kind of car fire can often times be prevented by taking your car in for regular maintenance. Another way that a car fire can start is from the rear of your car. If this is happening to your car, there is only one thing that you can do, get as far away from the car as possible. With the gas tank being in the rear of most cars it would be foolish to risk your life to try and put out a fire in the rear of your vehicle. The Schafer Law Office sends their regards to the victim who was badly burned in the car fire on the Gene Snyder Freeway and we commend the fire rescue team that acted quickly to remove the victim from their vehicle. Also, we are here to tell you that any time that you spot smoke coming from your car it is not to be taken lightly. Follow the steps above and always stay focused on the road to avoid accidents. Car fires happen way too often in the United States and by being more aware of our surroundings we can help to reduce that number.